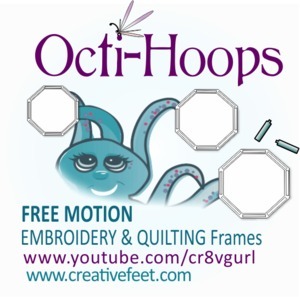 Use the Octi-HOOPS and enjoy Free-Motion Embroidery and Quilting Pain Free! Clare Rowley, Inventor of the Creative Feet and Octi-HOOPS has your health in mind when she creates all of her products. The Octi-Hoops are so easy to use, children as young as 3 have embroidered and our youngest quilter is only 8! When Free Motion techniques are as easy as coloring, everyone has the ability to create amazing quilts and embroidery projects with any sewing machine that can do free-motion! Click here to view machines that cannot do Free-Motion. View our Dragonfly Embroidery Video and others below to learn why so many sewing enthusiasts are so happy with their Octi-Hoops! Take your embroidery and free motion quilting to the next level with a Creative Feet Octi-Hoop Kit. 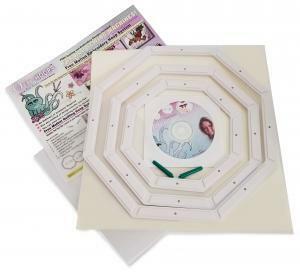 Turn any sewing machine into a embroidery or free motion quilting machine when using the Octi-Hoop Kit. A significant benefit of using the Octi-Hoop Kit is that you get to remove the presser foot, thereby making it easier to see what you are doing, plus without the foot, you do not have to worry about the fabric puckering. 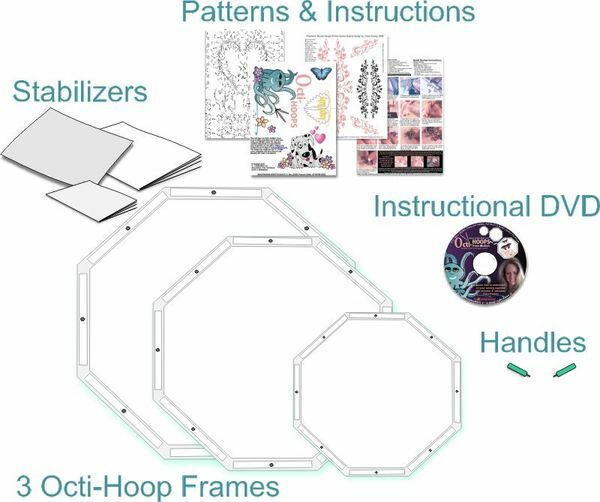 Included in each Octi-Hoop Kit, you get three octi-hoop frames (11.75", 9.75", and 7.75"), two handles, three stabilizer samples, instructions, patterns for embroidery, and a quilting and instructional DVD. 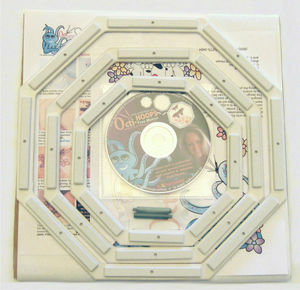 Includes: 3 Octi-Hoop Frames, 2 Handles, 3 Stabilizer Samples, Instructions, Patterns for Embroidery and Quilting and Instructional DVD that works in your TV DVD Player and Computer DVD player. Three different size frames to match your project needs! So easy to use, children as young as 3 have embroidered! Simply take your foot off the machine and lower your feed dogs to get started!